Heat treated steel bushings. The sizing diameters are hand polished with a surface hardness of Rc 60-62 to reduce sizing effort. Bushings are available throughout the range of .185" thru .368" in .001" increments. 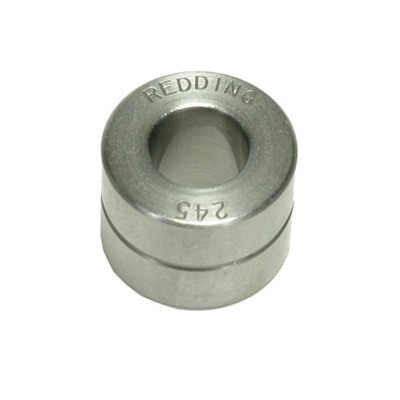 The last three digits of the part (#RD73XXX) denotes bushing size. The proper bushing size can be easily determined by measuring the outside neck diameter of your loaded cartridges with a precision micrometer or a dial caliper. Then, simply subtract .001" from the cartridge that had the smallest average neck diameter. This diameter bushing will generally size case necks just enough to create the proper press fit for the bullet. If you are using a Type “S” style die and not turning the outside of your case necks, we suggest using a bushing .002" smaller than your smallest average neck diameter, and using the expander ball included with your Type “S” die. This size bushing will still give you minimal sizing (maximizing the life of your brass) and the expander ball will insure that each cartridge has the same bullet grip. Redding has found that when you have cases with neck wall thicknesses on the thin side of the SAAMI tolerance, your fired case will measure considerably larger (.006" to .010" larger) than your loaded rounds. In these circumstances, Redding’s tests have shown that a bushing .001" larger (than the loaded round) may give you the desired bullet grip.